The Heights is one of the older neighborhoods in Little Rock, and one of the most affluent. Much like Hillcrest, you can find a variety of styles of homes ranging from the late 1800s to the 1900s. The Heights tends to be more conservative than Hillcrest. This area has an average home sale price of $152,661 (houses in the area sell for an average of $150/square foot). Kavanaugh Boulevard runs through the Heights and Cammack Village is on the northern border. The part of Kavanaugh to the North of Cantrell is the Heights. The Heights doesn't have the fine dining that you can find in nearby Hillcrest, but you will find some good restaurants like Cheers and Fantastic China here. ZaZa's Pizza and Salad, Heights Taco, and Tamale are local favorites. You'll find lots of unique boutiques and shops in the area and in nearby Hillcrest. Some of our faves include ​Boswell Mourot Fine Art, Cobblestone & Vine, Eggshells Kitchen Company, Go! Running, The Painted Pig and Wild Birds Unlimited. The Little Rock Country Club can be found in the Heights. You'll also find offices for the Arkansas Symphony and the Diocese of the Catholic Church in this neighborhood. The closest hotels are the La Quinta Inn Little Rock at Rodney Parham Rd and the Economy Inn at 4000 W Markham St, 501-664-0950. 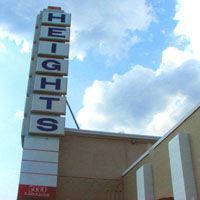 The Heights is part of "The Pulaski Heights" development that includes Hillcrest and the Heights. Pulaski Heights was incorporated in 1903 and annexed to Little Rock in 1916. Both areas have developed their own personalities since the early days. The street that runs through both suburbs, Kavanaugh, was named for the founder of the Little Rock Baseball Association. The areas were so-named because the upper portion of the area is "The Heights" and the lower portion is "Hillcrest."